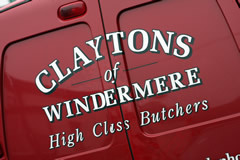 Claytons of Windermere, owned by Andrew and Sharon Wright, is a high class independent traditional butcher’s shop located in the centre of Windermere, Cumbria. The shop was established in 1907. 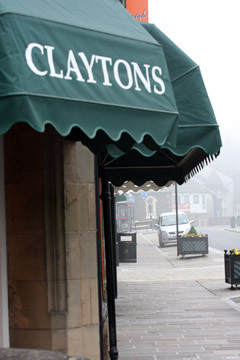 Andrew has worked at Claytons since 1984 and has owned the business along with his wife, Sharon, since 1998. 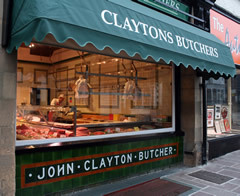 We specialise in supplying quality English and British meats, including beef, lamb, pork and Cumbrian poultry. Our much sought after local beef and lamb is supplied by Mill Brow Farm at Skelwith Bridge, subject to availability. The produce is from farm to shop in 24hours, with only 29 food miles. We prepare quality meat to our customers requirements. Our opening hours are Monday-Friday 7am-4.30pm and Saturday 7am-1pm. As well as retail trade through the shop we also offer wholesale trade and a free local delivery service.